DrewBoy Creative‘s signature color show. In 2019 we will feature the color green. This juried show is sponsored by Prohibition Glass, Allen Brecke Law Offices, and Numerica Credit Union. DrewBoy Creative celebrates the Piñata in 2019 and encourages artists to submit their interpretation of this cultural icon. May 3, 2019, 6 - 9pm. DrewBoy Creative presents our first ever All-Women art show. Come celebrate female artists in our community during at this juried show highlighting women of the Tri and their work. DrewBoy Creative presents an art show by Ayleen Wood. Come tour a large collection of art inspired by the many different cultures in the Tri-Cities, WA. Ayleen is inspired by, "Happiness and nature. You know that feeling you get when the sun finally sets at the end of a hard day at work or when you take the first bite of a delicious home cooked meal you worked on all evening? That’s the feeling I’m inspired by." Her techniques vary and for this show she has employed them all. Most of the paintings were created using a loose and carefree style - childlike and fun, painting for the joy of it. “No subject is too low, no idea too farfetched, I want to paint everything before I pass away,” said Heidi. The art show will also feature live music, an art raffle, a Dia de los Muertos altar, and the audience is encouraged to dress up to celebrate Halloween. “This art show means an opportunity to explore my mortality and ultimately rise above the fear of death to a greater understanding of life,” said Heidi. Art show sponsored by Numerica Credit Union. The Latino Heritage Mural Committee, DrewBoy Creative and the Tri-Cities Hispanic Chamber invite you to meet the muralist Andrew Reid at the DBC Gallery, May 18, 6 – 8 pm. The gallery is located at 285 Williams Blvd., Richland, WA 99352. Reid is the artist creating the Latino Heritage Mural at the Port of Kennewick's Columbia Garden Wine & Artisan Village. The Mural will be unveiled to the Tri-Cities community Wednesday, May 23, 2:00 pm, Columbia Gardens Urban Wine & Artisan Village, 421 East Columbia Dr., Kennewick, WA 99336. DrewBoy Creative showcases rising star Ashleigh Rogers in her first solo show. Winner of the People's Choice and Gold awards at this year's Yellow Show, Rogers brings her unique portraits to DrewBoy Creative. An art show by Davin Diaz about the colonization of Mars, featuring an original score and live music by DJ Honeysauce, and poetry by Brandon Sullivan at 6:30, 7:30, and 8:30. A no-host bar will be provided by Castle Event Catering. DrewBoy Creative celebrates the color yellow at our signature show. This art show is proudly sponsored by Joe Cruz, Steve & Sara Schwan, Painted Piano, and Magnolia Music Studio. February 2 - February 24. DrewBoy Creative is proud to host its first film festival and premier the mental health documentary "inVisible". DBC will also show "Faceless Fields of Colour" the documentary about the artist Cameron T. Mills and his creative process. The festival will feature films from the Northwest filmmakers. This event is for mature audiences. We will have wine and food for sale. This event is free, however, if you wish to support DrewBoy Creative we have a suggested $4 donation at the door. Sponsored by Richland Rotary Club and Ryan & Jamie Brault. Solo art show by Andrew Hill. This show is sponsored by Cox Creative Ventures. This art show will feature artistic interpretations of Immigration and Refugees: the wall, travel bans, citizenship for sale, deportation, or climate refugees. This show is proudly sponsored by Cox Creative Ventures. Ashleigh Rogers, Ayleen Wood, Bobi Wilson, Brockton Bensch, Cassie Taylor, Davin Diaz, Jessica Vorheis, Laura Turo, Lené Kimura, and Mills Art will showcase art created in the last four years. Art priced to sell. $4 suggested donation at the door if you have the ability and willingness to give. There will be a non-host bar. Pixelated Archipelago is a series of oil on canvas paintings that confront, through abstraction, our society's increased connected-ness and simultaneous increased isolation as a result of experiencing much of life through screens. Pixelated Archipelago takes the essential until of the digital world, the pixel, and makes it concrete, a fixed dab of color.The exhibition reframes a common experience and confronts the viewer with what he or she is actually viewing and/or experiencing while living a considerable amount of his or her life mediated by a screen. DrewBoy Creative presents, "inVisible" an art show about mental health. To unravel the negative stereotypes associated with mental illness. For people to openly share stories about mental illness. To create art that encourages empathy for those afflicted. To create a safe space for discussion. To provide information about mental health. This show is proudly sponsored by Lourdes Health Network, NAMI Tri-Cities, Castle Event Catering, and Joe Cruz. "I'm in love with the simple intricacies of life. People can do whatever they want. I do whatever I want. Life is The Beans," Arta Marie. This show encourages the audience to get lost in the shapes and colors and appreciate the art for what it is. We want the audience to feel out of place, but be themselves. As such, we ask you to wear your 'fun' clothes. Find that dress or shirt that's buried in the back of your closet because there is never the right occasion to wear it. This is that right occasion! $4 suggested donation at the door. Adult beverages provided by The Emerald of Siam Thai Restaurant and Lounge. The show is sponsored by Cox Creative Ventures. DrewBoy Creative's Orange Show features artistic interpretations of the color orange. This is a juried show. DrewBoy Creative's Orange Show features artistic interpretations of the color orange. This is a juried show. Jurors include: Sena Clara Creston, Washington State University Tri-Cities and Lori Sams, Feves Art Gallery Director. Two awards, created by the jurors, will be distributed to the artists. A People's Choice Award will also be given out. This art show is family friendly, all ages welcome. DrewBoy Creative will host a Don't Panic Show in partnership with Confluent Space Tri Cities January 20, 6pm. The theme of this show is "State of the Union". A message from Confluent: "For this event we have selected the State of the Union as our theme. We are asking artists, and poets to create work that speaks to the current political landscape. Don't Panic, use this opportunity to show the world how you feel about the changes that are taking place in our country. Be loud speak your mind, through your art. Be volatile, hold nothing back. If you would like to present your state of the union address." There are no entry fees and you can just show up with your artwork, however, to secure the best spot possible please contact Davin Diaz at callfa.dbc@gmail.com. DBC reserves the right to reject any artwork on any grounds. New mixed media paintings, collages, weavings, and sculpture by Cameron & Kathryn Mills. This art show is proudly sponsored by Green2Go. New mixed media paintings, collages, weavings, sculpture, collaborative audio/visual performance featuring live music from V.H.S., by Cameron & Kathryn. This art show is proudly sponsored by Green2Go. $2 suggested donation at the door. DrewBoy Creative is proud to host its first Day of the Dead Art Show. The art show will feature artists and dreamers artistic visions of their interpretation of Day of the Dead or Traditional Halloween. Artwork will also explore artistic visions of the artists' ancestors. This art show is proudly sponsored by Cox Creative Ventures. 1. The CTP Award presented by Steve Lee for creativity, innovation, and amount of *^%# given (ideally zero). 2. Vanguard award presented by Claire Dann for creativity and originality, quality of artistic composition and overall design, and a work that challenges the current local conventions of what “art” is (relevance to contemporary art and visual culture). for unique character ...and the use of light, negative space, and color palette. The awards are designed by SCRAP Tri-Cities. 1. Please park across the street at the Uptown Shopping Center and use the crosswalk when crossing Williams Blvd. 2. We will have a Dia de los Muertos altar designed by Annie Warren, Israel Garcia Duran, and Madison Rosenbaum. You are welcome to bring photos of your loved ones. 3. Awards, excluding the People's Choice, will be handed out at 6:40pm. 4. Families are welcome the first hour, 6pm - 7pm. 5. Confluent's festivities begin at 7pm. There will be alcohol served, as well as bands and a haunted house. There are entry fees associated with the activities. Please see Confluent Space Tri Cities for more information. The Shoe Show is a project by artists Cameron and Kathryn Mills to celebrate the positive and creative non-violent demonstration that took place in Paris, France during the COP21 climate summit in November 2015. The French government banned public demonstrations and put climate activists on house arrest before the summit. The project consists of a series of paintings containing over 10,000 shoes, matching the Paris installation shoe for shoe. $2 donation to enter please. The show is proudly sponsored by Green2Go. DrewBoy Creative presents "My Universe" an Art Show by Thelma Triplett. Thelma Triplett is the RED Show People's Choice Award Winner. The show will open 6pm on September 9 and run through October 16. Thelma Triplett’s intuitive style is expressed in a variety of media and explores a wide range of moods and emotions. Most of her work is concerned with capturing the essence of things. Some works are nature oriented, while others make social / political statements. She has had 13 one and two artists' shows and has received numerous awards. Her work can be seen in numerous corporate and private collections, as well as several publications such as the Artists Archive Project Central Washington Artists 2007-2010 and Indianapolis Magazine. 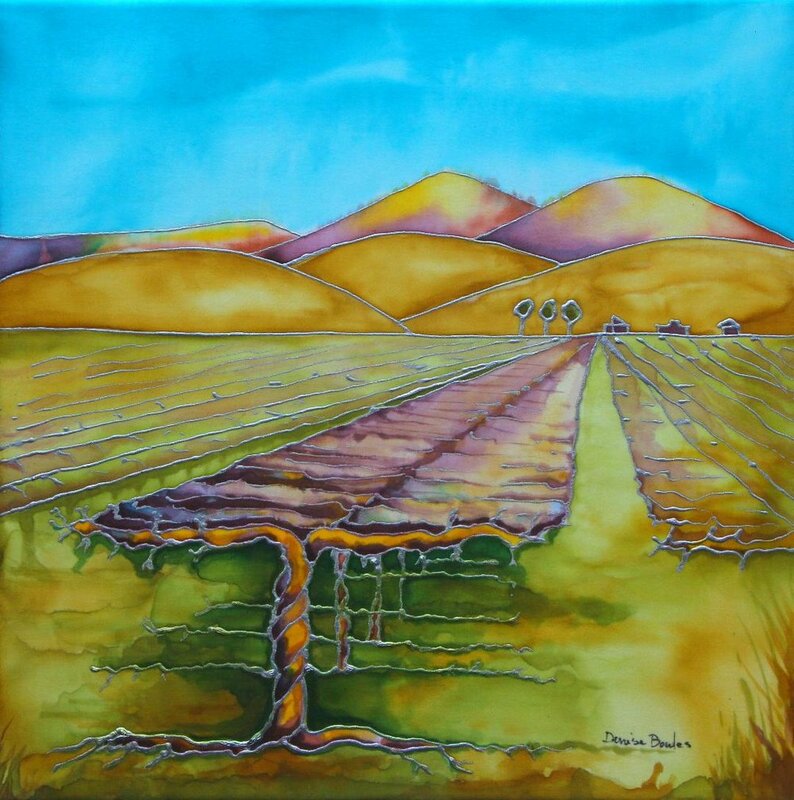 She has lived in Richland, Washington since 2000 and is inspired by the geology of the region. She came to Richland from Columbus, Indiana. Ms. Rhoda's Wine Garden will be pouring wine at the event, 21 and over only please. The New Direction Project and DrewBoy Creative will host an art show featuring artwork having to do with the challenges of mass incarceration and the disproportionate numbers of people of color who find themselves trapped in the criminal justice system. The opening reception is August 19, 8 pm and will feature music and spoken word. "Experience the Light" is a series of 10 acrylic paintings of dark and colorful scenes, by Jessica Vorheis, juxtaposed against surreal and obscure imagery conveying what light is and who light. Allen Brecke Law Offices and Ron Hicks, LLC are proud sponsors of this art show.